Special thanks to photographer Paul Haring who captured this shot of my auction floor team member showcasing the potato cannon. 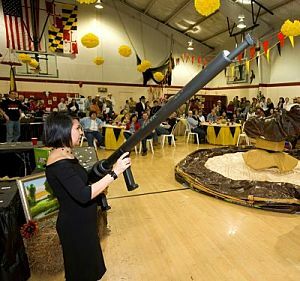 Unique school auction items that are properly marketed can sell big — like this potato cannon which commanded $1000 … twice! It sold well not only because the item was clever, but because the school did an exceptional job of promoting the item. To learn more about how the school marketed the cannon, listen to this week’s podcast. As a side, discover 100 other top-selling items (like this potato cannon) by getting my free Auction Item Guide. It’s the best items I sold in gala auctions around the country, last year.